This blog should be renamed – Stopping and Starting Vietnamese. But I have a really, really good excuse for the hiatus. You know, that darling little baby I told you about last summer. Now that Little is eating more food, and loving everything we put in front of her, I’m getting back in to cooking. Usual modifications for our flavor preferences are upstaged by modifications for less sodium / sugar / spice. Not always easy with Vietnamese cuisine. Not that we have to worry about flavors – the girl was squawking for more mouthfuls after her first slurp of bun mam, a fermented fish noodle soup that even took me several encounters to love. She hesitated a bit with stir fried bittermelon, but if that isn’t an acquired taste, I don’t know what is. My frequent routine is to head to market Saturday or Sunday morning, and prepare protein or the most complicated dishes Sunday evening. If I cook ahead or at least marinate and have on hand the right proteins, all I need to do is prepare a quick fresh veggie and it seems like I was chained to the stove all day rather than in the office. Lately these green beens have been a bright spot with our ca kho (caramelized fish) or ga kho gung (caramelized ginger chicken). Clean and trim the ends of your green beans. Roughly chop green parts of all onions, using only 2 of the white bottoms. If you want super onion-y dish, go ahead and use them all. If not, use in soup or kho caramel dish. Heat oil in sauté pan or wok over medium-high heat. Once hot, add garlic and cook until fragrant. Add green beans and white onion pieces, stirring to coat in oil and garlic. Add fish sauce, sugar and light soy, mixing well so sugar dissolves with the vegetables. Stir frequently and cook for a few minutes. Add green onion pieces and black pepper, cook for another minute or two. Remove and serve hot! Beans will still be crunchy. If you want them softer, you could add some water and cover to steam-cook before adding green onions and pepper at the end. We usually make a more Chinese-style green bean dish with oyster sauce, but after the first serving, Anh is won over. We’ll be making these from now on. 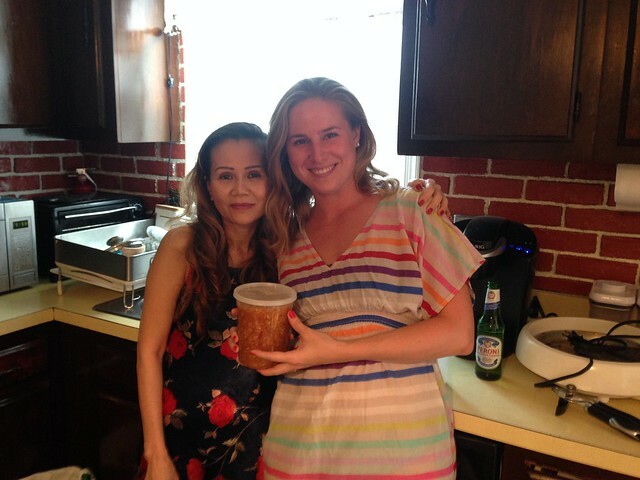 My mother in law’s nuoc mam gung (ginger dipping sauce) is legendary. No one in the family makes it like her. I have made several feeble attempts that mostly proved to be failures. Edible, but failures nonetheless. Rather than ask her to make the sauce for me every time I prepare Bun Mang Vit (Duck and bamboo noodle soup), vermicelli bowls, or any of the other dishes we enjoy with the sauce, it was time for me to learn. But I still need to see about how much of everything goes in to this magical concoction. We called her up the other weekend and said we’d be over to make the sauce with strong warnings not to have it already made before we arrived. She didn’t make it, thankfully, but had the other ingredients ready and waiting. 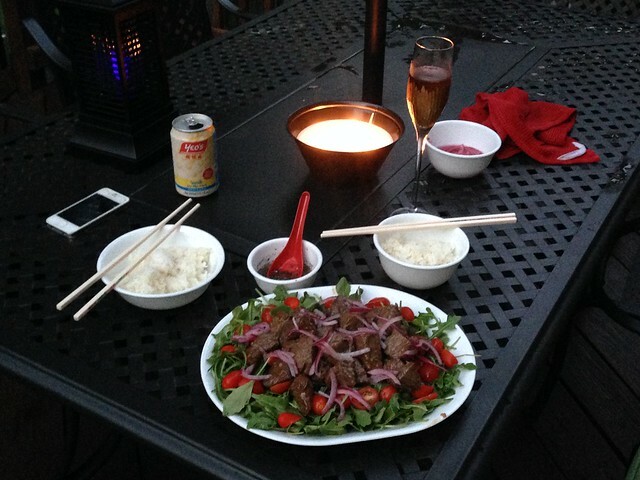 I had a craving for the super simple yet flavor-packed Bo Luc Lac, or Shaking Beef. It’s also one of my favorite dishes to say. I know I’ve made it several times but apparently never blogged the recipe. My sister in law makes a really great version of this simple main dish adding mushroom sauce in addition to the typical oyster sauce. Traditionally, the seared beef cubes are served atop crisp, raw watercress and tomato slices. I had arugula and cherry tomatoes left over from and Independence Day fresh corn salad and decided to use those. The arugula has the same peppery bite as watercress, and it easier to eat! I’ve seen many recipes call for tossing the greens in a vinaigrette, but I don’t think it’s necessary with the muoi tieu chanh (lime, salt, and pepper dipping sauce). Ideally, you want to marinade the beef overnight to achieve maximum flavor, but 30-60 minutes will do in a pinch. You want tender beef – steer clear of the time saving beef cubes that are usually stew meat. You’ll tire of chewing before getting full. Prepare in the order below and serve with rice and one or two other small dishes to round out the meal. Now if this isn’t a picture of summer, I don’t know what is!